2015 was a monumental year not only for real estate but for Japan overall. To the vast relief of this author, most of the predictions made at the beginning of 2015 have turned into reality. Looking forward into the unknown that 2016 will bring, we can see some evidence that the grand experiment called Abenomics has light at the end of the tunnel, albeit still a pinprick, that allows onlookers cautious optimism that Japan, starting with Tokyo, is on the path to sustainable economic recovery. A recent American Chamber of Commerce Journal article by Anthony Fensom sums up generally the challenges for the year ahead in broad strokes. There are hordes of graphs floating around about Japan and what Abenomics is doing for or to the country depending on one’s attitude. 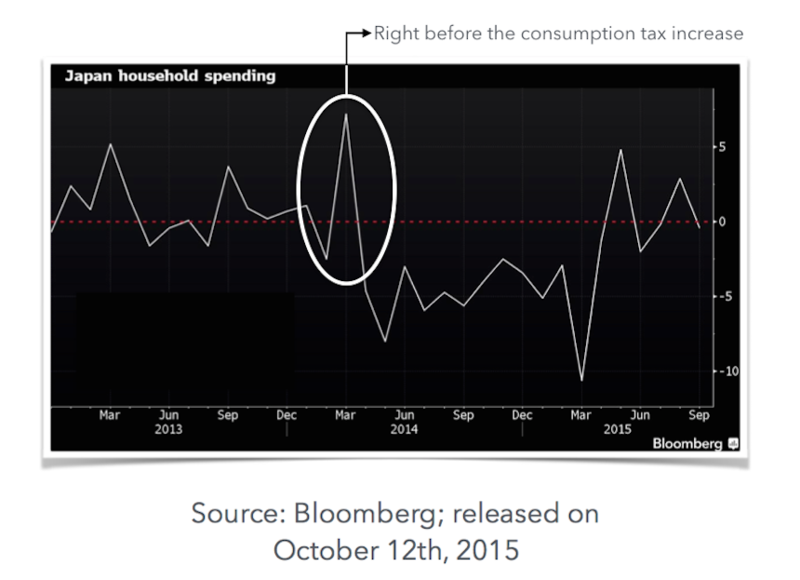 Given the implementation to date, Abenomics has boiled down to two graphs that will dictate its fate; base wage levels and household spending. 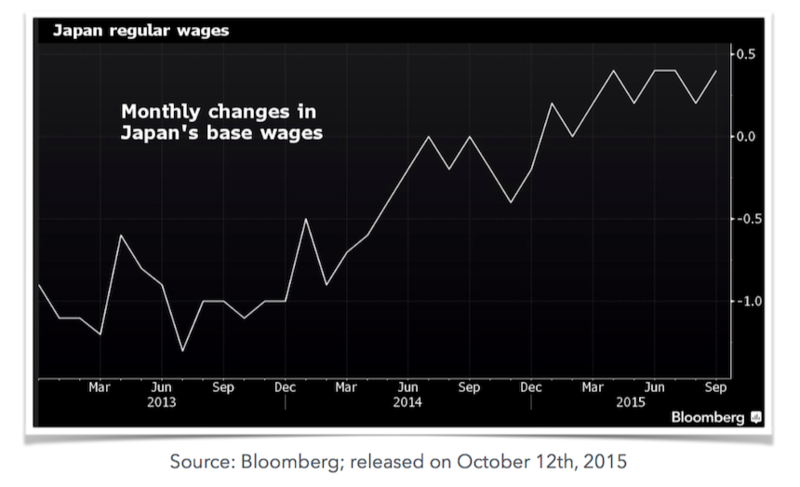 In October, 2015, Bloomberg released a very informative article that illustrated the movements of both nationwide base wages and household spending levels. Data in 2015 showed base wages moving into positive growth territory while household spending remained volatile. Increased wages are a precursor to increased household spending and in a country like Japan where corporations and individuals hoard cash in savings account, a single digit increase in corporate and consumer spending translates into a double digit increase in GDP, as exemplified by the April 2014 consumption tax increase. Immediately prior to the tax increase, consumers and corporations across Japan went on a shopping spree buying larger items in the efforts to save the difference between 5% to 8%, the consumption tax rate now. As a result, the GDP numbers for the quarter ending March 2014 were the highest raise in GDP since the advent of Abenomics. This was followed immediately by one of the worst GDP performing quarters since the advent of Abenomics as Japan’s shopping spree stopped and everyone was back in saving mode. Despite this evidence and Mr. Abe’s government doing anything and everything a public sector can to assist in creating an environment where Japanese companies can rake in record profits, corporations are still slow to the table when it comes to investing those profits into human capital. Sick of trying to coax companies into doing their part, Mr. Abe and Mr. Kuroda, Governor of the Bank of Japan, are looking to take matters into their own hands. According to a Reuters article released January 3rd, Mr. Kuroda is now seeking the advice of ETF promoters in large domestic banks on creating an “Abenomics” index of funds whose underlying companies are proven to have track records of spending their profits at home. Put simply; Mr. Abe and the Bank of Japan are out of patience with Japanese corporations not meeting expectations in terms of raising wages. To underscore this further, on Friday, January 29th, Mr. Kuroda stunned economists worldwide by adopting a negative interest rate policy set to begin February 16th, 2016. This applies to certain excess cash reserves and is meant to spur banks to lend more. For banks that hold excess reserves with the BoJ in addition to what they are legally required to, those excesses will be subject to the tiered negative interest rate policy. Whether the banks can lend responsibly or not is the question that remains to be seen as irresponsible lending practices, albeit for a different set of circumstances, were what created Japan’s famed Bubble Era economy. As 2016 progresses, the BoJ’s actions regarding how much further interest rates will sink and whether or not BoJ ETF purchases for companies “doing their part” become a reality will be the actions to watch. If implemented reasonably well, then it will translate into higher wages and more corporate spending. Japan has a dwindling workforce due to a dwindling population. Mr. Abe is determined to make more of a place for women in the workforce specifically in higher lever management positions. It is famous that Japan has a dismal record when it comes to gender equality. According to the Japan Times, Japan ranks 104 out of a ranking of 142 developed nations in terms of gender equality. While the situation is slightly improving, if it stays at the same pace as for the past decade, then it is estimated that Japan will have gender parity 81 years from now. Mr. Abe is hoping to speed this up drastically with sweeping reforms aimed at enticing companies to hire and retain for of the fairer gender for longer. According to Mr. Abe, women should no longer have to choose between family and career. This is a huge hill to climb as it inherently means Mr. Abe will tackle very traditional societal mentalities when it comes to the role of men and women. “Okusan”, Japanese for wife, is represented in the language with the Kanji for “deep”, meaning “the person at the back of the house” (usually where the kitchen in older Japanese homes were designed to be). From a Western perspective, women should be raising their voices in complete and utter support of a government that is finally pushing gender equality as a staple of it’s governing policy. Unfortunately, most Western media are missing a crucial point; whether women in Japan actually want careers while raising a family. A survey conducted by the Intelligence HITO Research Institute in April, 75% of the 1,058 respondents said that they did not want more responsibility at work according to an article by The Diplomat. This contrasts starkly with respondents asked the same question in China and Australia, with 72 and 69 percent respectively answering they wanted more responsibility at work. According to Japan Today, in a similar survey conducted by Japan’s Health, Labour and Welfare Ministry in 2013, out of 3,000 women between the ages of 15-39, a full one-third stated their largest goal in life is to become a housewife. The worrying trend of all this is Mr. Abe’s government betting that once an environment is created that is conducive to allowing women to be mothers and have a career like it is in other G7 nations, increased participation by Japanese women in the workplace will naturally follow suit. Would Japan’s women actually want to pick up the mantle and do what Mr. Abe’s government is expecting remains a huge unknown. While the desire is there from Japan’s women to return to the workforce after pregnancy, the actual numbers returning back are small compared to the other industrialised nations. Observers of Japan for a long time have argued that in order to fix a dwindling population, increased immigration is the path of lesser resistance to a meaningful demographic solution in the fastest amount of time. However Mr. Abe’s government is slow to move on this item, mainly due to entrenched apprehensions that exist in the Japan’s society regarding more inclusion of foreigners in society. These apprehensions however tend to be misinterpreted by media outlets that claim to represent the English language view (and therefore the representative “foreign” view) of Japan. A very well articulated Japan Times article on Japan’s “No Immigration Policy” outline the prevailing journalistic view nicely. However this type of view sits atop an erroneous foundation that Japan wishes to protect the homogenous nature of the culture above all other economic costs. In Japan, the term “NEET” (Not in Education, Employment or Training) and “Freeter” (a term for people continuously in low impact, part time jobs) are not derogatory terms like they would be in other countries. These are uniquely Japanese terms used to describe the same type of people often called “welfare bums” in Western countries, particularly when referring to “NEET”s. Since the late 90’s, NEET & Freeter rates have been steadily rising with no serious plan to stem the issue. For anyone Western who has raised children in Japan, there is a constant battle between the parent’s desire to nurture a critically thinking, responsible adult versus Japan’s tenancy to make large, sweeping societal excuses for their young not having any ambition. Some immigration reform opponents aren’t racist but more argue that the country should stem the growing numbers of Japanese NEETs and Freeters prior to allowing more immigration. Other opinions argue that immigration reform would hurt the necessity needed to innovate. According to another, well written Japan Times article, Yoichi Kaneko of the Democratic Party of Japan argues that if the country depended on immigration rather than developing technologies to solve labour shortages, then the urgency to innovate would dwindle. According to Mr. Kaneko, investing in labour saving technologies like this now would not only solve Japan’s declining demographic problem but would also allow Japan to export these technologies to other countries facing the same demographic dilemma. While Japan has the most pronounced ageing population, it certainly isn’t alone. Germany, South Korea, China and even the United States are some of the economies facing the same ageing population problem. Mr. Kaneko argues that labour saving technologies once developed originally to solve Japan’s ageing issue could be exported other developed and developing economies. While Mr. Kaneko’s opinion might seem like an idea ahead of its time, the anti immigration stance is one definitely not rooted in racism. The position is more born from a desire to domestically innovate while at the same time stemming spreading apathy among Japanese people. As a Canadian living in Japan for 13 years, I would rather see a domestic population excited about it’s future more than I would like to see increased numbers of cynical brethren joining me on the island. Once this is achieved, I can tell you Japan will be a MUCH more desirable place to live and work then it is now. What does this mean for real estate owner’s and buyers? Moving forward through 2016, we expect this to be a make or break year for Japan. Many of the backbone policies of Abenomics’ third arrow must have some concrete steps of action implemented by the end of the year if the grand experiment has a hope of becoming a success. How you feel about about these topics should guide you to the right decision for your portfolio. If you feel that Abenomics is the reason Japan’s economy will sink into the Pacific, then buying now isn’t for you. There are still uncertainties that need to be hammered out to clearly predict the nation’s future. Similar to buyers, if you feel that Abenomics is going to ruin the country, then you are best to sell in 2016 as you will most likely be able to leave the market higher then when you bought. On the other hand, if you believe that the social cohesion found only in Japan is strong enough to overcome the challenges ahead, then you shouldn’t wait much longer to purchase in Tokyo or pricing will soon leave the realm of being a lucrative investment to being merely a good one. Depending on your beliefs and personal circumstances, owners might do best to hold for a couple years to see how the above societal debates and arguments play out in creating sustainable, economic growth in Japan. One thing is for certain however; 2016 will be one of those rare years where the market will be beneficial to both buyers and sellers alike.